US: It was my wife who applied for the job for me. 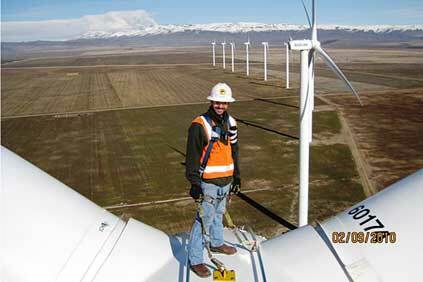 I had mechanical experience from the automotive industry and I was used to heights from fitting nets at baseball grounds, so turbines would be no problem. Then she looked on a map for Mountain Home Wind Farm in Idaho, and wasn't so keen that I take the job. But I went for the interview and I saw the turbines. I was in awe. The job really appealed to me, so we moved to Mountain Home, a town with 11,000 inhabitants. There's not much to do, not many restaurants or stores, and that took a bit of getting used to. But the work is stable and I really enjoy the climb. I get up around 5am, pack a lunch, grab coffee and drive half an hour to the office, where we plan the day. There are eight technicians, working in pairs, maintaining 34 Suzlon S88 2.1MW turbines, which are still under warranty, and there are more being assembled. Some of the turbines are 10 miles from the office, others as far as 30 miles away. Around 70% of our work is routine servicing and maintenance, like oil changes and tune-ups. The rest includes electrical and mechanical troubleshooting. The turbines have a control system that will alert us to a fault so if, for example, a blade throws up a fault, you can check on the laptop which one it is and what has to be done to sort it. There are not many faults now that the turbines have been here for almost two years, but we are kept busy upgrading components or rewiring. By the time we set off in the trucks, we are kitted out with all our gear: the mandatory steel-toed boots, safety glasses, hard hats and harnesses. If we are doing much electrical work, we are issued arc-flash gear to protect us from sudden flashes of electricity. We also have arctic gear for the winter - the wind is pretty cold up the towers. We are often working on towers that are still producing power and we climb while they are running, and then flip the switch at the top to shut them down. It's not as noisy inside the tower as you might expect but, when you get to about 60 feet from the top, it really sways - you need good sea legs to be up there. Our turbines are 280 feet high and have around 280 steps. Some technicians skip rungs while climbing - I've tried it, but it isn't for me. I've climbed four towers in one day, but it is usually two or three, and that does keep you fit. We lift all our equipment to the top in a chain hoist, and a few towers have recently had a hoist fitted for people, which lifts about 60% of your weight off you. You have to unhook yourself before the top and climb the last few feet unaided. It makes a big difference. It's amazing just how heavy you seem during that last climb. Anybody who says it's not scary up there at the top is lying. If you can't deal with it, the job is not for you - but fear is a good thing to keep you safe. We have to climb outside on top of the nacelle to get into the hub to do work and, while you can sometimes stop and look at the landscape, you are usually busy with your head in the job. But if we're inside and one of the jets from our nearby air force base goes overhead, we like to look out and see what is going on. We break for lunch whenever it's convenient. If you're doing a service, tightening bolts and checking connections, you'll be up the tower all day, so you'll eat there. But if you are moving between towers, you can eat in the truck. A typical day is eight hours long but if there is a fault, you might not getout until 11pm. We write up our service reports at the end of the day. These are very detailed and note how much time was spent on the jobs, and what materials we used. It can often be a long, tiring day. But this job does give you a great workout. I am more agile, my lung capacity has increased, and my leg and arm muscles are really strong. I like the challenge of pacing myself on the climb. I've always enjoyed electrical and mechanical work, and that part of the job is similar to work in the automotive industry. Even my toolbox is not very different, except for the laptop and my trusty insulated screwdriver - which protects me from dangerously high currents. I've tried to entice some of my old workmates to join and, while they are keen for the regular work, the good money and the employee benefits, the relocation and the climb is ultimately what deters them. That's a shame, because this is a growing industry and we will need more technicians. As for our work here, we are employed by Suzlon as the turbines, which are owned by John Deere, are still under warranty. Our philosophy is that if we do a good job then we might be signed up for a service contract when the warranty is up. What approach: condition-monitoring systems or hands-on?